The Nostalgic German DollHouse. Typically Germany was noted for its superior ability to fashion superb Doll Houses. It shipped these fashionable structures to Central Europe, Britain, and North America. Japan even copied their detailed designs. 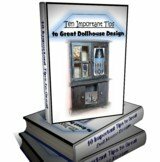 After World War II doll houses were manufactured in greater quantities with less attention to detail than ever before, thus making the models more accessible than ever for middle class folk to own them. This square model simply looks intriguing. Oh to live in the time when people were good craftsmen. Not that there are not those today, it's just that everyone seems to want it now. No one seems to slow down long enough to bring out the details and enjoy the journey. In Germany during the middle part of the 20th century 1:10 scale became popular based on the metric system. 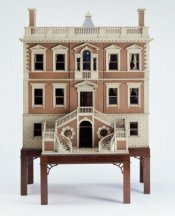 Dollhouses coming out of Germany today remain closer in scale to 1:10 than 1:12. It was made in the early 1860s and rumored to be constructed with something as simple as orange boxes. We are trying to imagine this process. Our orange boxes today tend to be rather small. But back then.... it definitely was a different era. Notice how beautifully detailed it is. Awesome. To have that talent ourselves! From the furniture to the outside this house is amazing. 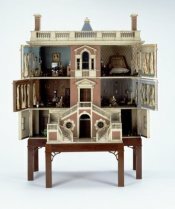 It is fashioned with furnishing from an important German doll's house furniture maker - Schneegas of Waltershausen. The German craftsmen definitely were talented.